After falling down and cutting your knee you wonder, “how is my body going to be able to heal after developing such a large wound?”. In order for your body to heal adequately it must undergo three phases of wound healing. Each of these three phases known as the inflammatory, proliferation and maturation phases are all required to ensure that your body heals and returns back to its normal function. To help understand these different phases a little better I will break down each process. Whenever you injure yourself or find yourself sick, your body creates an immune response to assist in your body detecting that a foreign body is present. After the initial wounding, blood vessels within the wound bed contract, this results in a clot being formed to prevent continuous bleeding occurring. Once haemostasis (a balance within the body) has been reached the surrounding blood vessels will dilate to allow essential cells such as antibiotics, white blood cells, growth factors, enzymes and required nutrients to reach the wound. 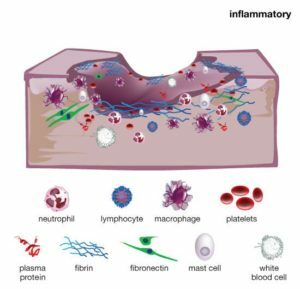 Within the inflammatory phase macrophages, neutrophils and phagocytic cells produce a host response to remove and eat away at any necrotic (dead and blackened tissue) and sloughy tissue which will prevent and delay the wound from healing. While this phase is happening inside your body you may notice signs of erythema (redness of the skin), heat, oedema (swelling caused by fluid retention) and pain within and around the wound’s surrounding areas. 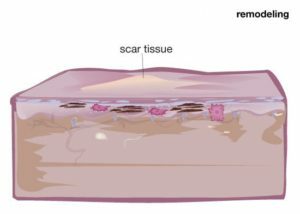 During the proliferation phase the wound begins to rebuild itself with new granulation tissue which is pink/red in colour. This tissue is made up of collagen and the extracellular matrix as well as a new network of blood vessels. 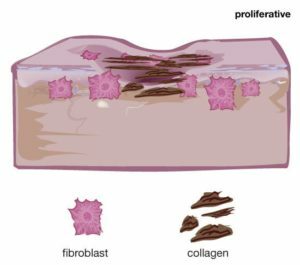 In order for healthy granulation tissue to be formed and maintained it becomes dependent upon fibroblasts (The principal active cells of connective tissue) receiving an adequate amount of oxygen and nutrients being supplied to the blood vessels.